Employing science and artistry, Smile Solutions’ experienced clinicians work with master dental ceramists to achieve veneers and crowns of the highest possible quality and craftsmanship. Veneers are thin shells permanently bonded to the surfaces of teeth to improve their position, shape and shade, as well the overall aesthetics of a person’s smile. permanently stained or discoloured teeth. They are made of either composite resin or high-strength porcelain. Composite resin (or “plastic”) veneers can be applied to the front teeth to make small to moderate changes in shape. They are useful to reshape teeth after orthodontic work, to repair small fractures or to close gaps between teeth. The material used is tooth coloured and moderately durable. These veneers can be made and fitted during one visit to your dentist, being manufactured in-house without the involvement of a laboratory. 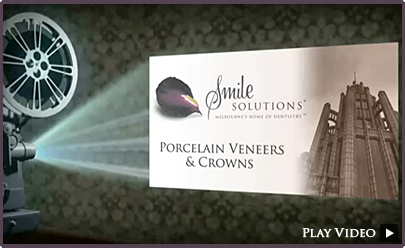 Porcelain (or ceramic) veneers are fabricated facings bonded to the front surfaces of the teeth. They are highly durable and resistant to staining and chipping. Porcelain veneers are excellent for moderate to major changes in tooth shape and texture and can be made to resemble the look of a natural tooth very closely. This type of veneer is usually manufactured by a technician in a dental laboratory and fitted by your dentist. How Do I Choose between Composite Veneers and Porcelain Veneers? Your choice may be determined by your preferred treatment process, your short-term budget and your desired outcome. The treatment process for composite resin veneers is one of direct bonding to your teeth, also known as dental bonding. (This is the same method that’s used to place a composite filling.) One of the advantages of composite veneers is that they require only one visit to the dentist. Another benefit is that composite is a cheaper option than porcelain in the shorter term. However, a disadvantage of composite veneers is they are not as strong as the alternative – being slightly porous, they must be maintained more regularly than porcelain and are rarely permanent. They can also lose their lustre after a while, so they need to be polished; and they can discolour, needing to be replaced. These ongoing treatments add to the cost factor in the longer term. The advantages of porcelain veneers is that they are more natural looking, are more durable and need less maintenance than composite as they don’t change colour or lose their shine. This makes them cost effective in the long term. On the other hand, porcelain veneers, as mentioned, are manufactured either chair-side or in a laboratory after your initial consultation, and are then placed by your dentist on a second visit. Veneers are a very durable option to improve the aesthetics and functionality of your teeth. The average lifespan of dental veneers ranges from 10 years up to 25 years, though it can be less if decay is allowed to develop. Ceramic veneers are not easily broken but they can chip or fracture if subjected to trauma or other structural overload, just as unrestored teeth can. And just like natural tooth enamel, a veneer can still wear or become damaged if subjected to the destructive forces of a grinding or clenching habit. Veneers should maintain their appearance indefinitely, although it might be desirable to replace them when, over time, gums have receded and the margins of the veneers have become visible at the gum edge, possibly with accumulated staining. What Does the Veneer Procedure Involve? Composite veneers require just one visit. First your dentist assesses your tooth to check that there is enough natural tooth to accept the restoration. The underlying tooth is prepared, if necessary, so the veneer will adhere, though composite veneers require very little of your tooth to be sacrificed in the treatment process. Next white filling material is applied in layers and then hardened with a ‘Bluephase’ LED light. This process is then repeated until the desired length, width and shade are achieved. For porcelain veneers your dentist assesses your tooth to check that there is enough natural tooth to accept the restoration. Next, your tooth is prepared by shaving back a thin layer to provide a surface for the porcelain to adhere to. Then, a temporary veneer is prepared and placed over the tooth while your porcelain veneer is created. About two weeks later your new porcelain veneer will replace the temporary one, and after being tried to check that it is a perfect fit, it will be permanently attached. Your dental practitioner will advise you of any special care requirements for your new restorations, as well as any follow-up appointments that may be necessary to check your progress. Keeping up a good dental hygiene routine, including brushing and flossing, combined with a scale and clean with your dental hygienist is very important. While the porcelain (or composite) that makes up your veneers cannot decay, the underlying teeth still can, and the teeth are vulnerable wherever they are exposed (at the back and sometimes the sides) and also where they connect with the veneers themselves. One of the benefits of dental veneers is they can protect the underlying teeth against decay. Providing you brush your teeth with fluoride toothpaste twice a day and use fluoride mouthwash regularly, dental veneers have been shown to resist decay. A dental crown, sometimes referred to as a cap, is permanently bonded to a particular tooth to improve aesthetics and function. A crown can be fitted over the remaining part of almost any prepared tooth and, if properly maintained, can last 15 years or more. When there is insufficient dental enamel to allow restoration with a dental veneer, a crown may be successfully used instead. a tooth needing protection following root canal therapy. The shape, size, colour and surface characteristics of a crown are precisely matched to surrounding teeth and provide a seamless and lasting restoration. There are three types of dental crown: porcelain, metal, and porcelain-fused-to-metal (PFM) crowns. Porcelain (or all-ceramic) crowns for back teeth are made of high-strength reinforced ceramic materials (e.g. lithium disilicate or zirconia). For front teeth, porcelain crowns may be made using an aesthetically pleasing ceramic material, or they may involve two layers: a high-strength material covered with an aesthetically pleasing material. All-ceramic crowns for front teeth give a very natural, pleasing appearance; they achieve the closest match to natural, healthy teeth. Metal crowns, which are often made of gold alloy, have been around since the early 1900s and require very minimal tooth preparation, as the metal is strong even in thin sections. When designed and constructed well, metal crowns are very durable and resistant to fracture. PFM crowns were introduced in the 1970s and appear much more tooth-like than metal crowns due the overlying porcelain. The metal core provides strength and durability. It is common to have a thin metal margin visible around the neck of the crown on the tongue side of the crown as this preserves more tooth structure. Dental crowns can still be subject to fracture and cavities, so it is important to look after them just as you would your natural teeth. If properly maintained through good oral hygiene and regular dental check-ups, crowns can last for many years. The material of your dental crown can affect the durability of your crown, but factors other than durability also need to be considered (such as aesthetics, survival rate and kindness to opposing teeth), so you are encouraged to discuss the different options with your dentist to choose the most suitable crown material. All types of crown can be fabricated at an external dental laboratory, where special techniques are used to design and construct a crown that will perfectly fit your tooth. At your first appointment with your dentist, your tooth will be prepared to the desired shape and moulds will be taken. A temporary cap will be placed over the prepared tooth to protect it. Then, at a second appointment a few weeks later, the crown will be fitted and bonded in place using bonding cement. Ceramic crowns can also be designed and milled onsite in the dental surgery, during your appointment, using CEREC CADCAM technology. CEREC allows for your tooth to be prepared and fitted with a crown all in one appointment – this means no temporary crowns, no moulds of your teeth and a much quicker procedure. Crowns perform just like your natural teeth. While they are very durable, you still need to maintain good dental hygiene and to brush and floss the crown just as you do with your other teeth. With regular dental check-ups, proper cleaning and the use of remineralisation toothpastes, you will be able to minimise the risk of decay around your dental crown. One of the most common dental treatments, fillings provide a way to restore a tooth that has been damaged by dental decay. They can also prevent further decay to the area. There are three types of filling material available, each with its own advantages. Your dentist will talk through with you which of these is more suitable for you, depending on the area that needs to be filled. 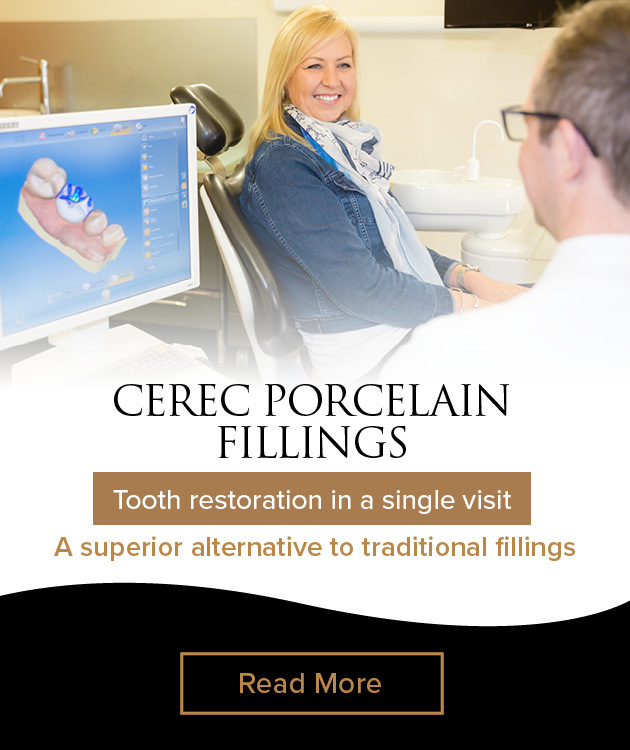 CEREC porcelain fillings allow damaged teeth to be restored in a single visit using a high-quality material that matches the colour, function and strength of natural teeth. Additional information regarding CEREC fillings can be found here. Amalgam fillings were previously the most common choice of filling material but as dentistry has evolved they are now seldom recommended or used by dentists. They are not as aesthetically appealing as other filling materials, and for this reason some people may opt to change their amalgam fillings for CEREC porcelain or composite fillings. Additionally, amalgam fillings are so strong that the natural flexion of the tooth around the filling can lead to cracks in the tooth. The lifespan of fillings varies according to the material. Porcelain fillings generally last from 10 to 15 years, though with advancements in materials, they are increasingly lasting longer than this. Composite fillings have a life expectancy of 3 to 5 years and will require replacing. What Does the Filling Procedure Involve? Fillings are a relatively simple treatment. The diseased part of the tooth is first removed and the area is then cleaned before it is filled. This is done within one visit to the dentist. Caring for fillings requires you to maintain your dental care routine, both with regular dental appointments and brushing and flossing every day. Fillings do degrade over time and eventually will need to be replaced. An all-ceramic bridge is sometimes used to replace a missing tooth. It involves a porcelain replacement tooth attached to one or two adjacent crowns. Dental bridges are very durable and can last for many years. One disadvantage of a bridge is that it involves removal of adjacent tooth tissue that may be otherwise healthy. For this reason, we recommend dental implants as an alternative to bridges where appropriate. However, bridges remain a viable alternative for patients who are not candidates for dental implants, or when existing bridges are being replaced. It’s important to understand that the cost of any dental treatment can vary between patients, depending on the complexity of the procedure, and who performs the treatment. No two mouths are the same, and so dentists will not necessarily be able to give you an exact cost until they have thoroughly examined your teeth. Although veneers might be considered expensive, with porcelain veneers costing more than composite veneers, patients are usually very satisfied with the results and admit that the benefits, such as improved aesthetics and (in the case of porcelain) a stronger material far outweigh the cost. There are a few different costs involved with veneers, from the X-rays to the process of bonding the veneers and the cost of the material itself. The costs involved with dental crowns can vary depending on the tooth that requires the crown, the materials used, and the clinician who performs treatment. Porcelain fillings are the more expensive dental filling material, but the longevity, strength and aesthetics they provide are considered well worth the price, and this is why dentists often recommend them. Composite fillings are more affordable, but it’s important to keep in mind that they have a shorter lifespan and so will need replacing more often. At Smile Solutions your veneer or crown procedure will be done by one of our experienced cosmetic dentists or specialist prosthodontists, with your filling procedure being performed by one of our general dentists. Our specialist prosthodontists can provide all aspects of prosthodontic care, including veneers, crown and bridge, occlusal rehabilitation and dental implants. Prosthodontists are specialists in the restoration and replacement of teeth; they work closely with dental technicians to ensure that each custom-made prosthesis is natural looking and comfortable to wear every day. If you are interested in understanding how to improve your smile with cosmetic dentistry, our complimentary Design Your Smile consultation has been designed with you in mind. You will meet with our highly experienced treatment coordinator to discuss the options available to you based on your individual expectations and budget. After you’ve discussed your ideal smile, photos and impressions are taken of your mouth, to give us a better understanding of how your teeth, gums, lips and face all work together in motion. These images are used by our in-house dental technician to build and design your dream smile using innovative techniques and the latest in visual technology. By visualising how your final smile will actually look within this complimentary consultation, you will be well placed to make the right treatment decision. Are you ready to build your dream smile? Contact us now on 13 13 96 to book your complimentary Design Your Smile consult. Our friendly and experienced team at Smile Solutions can help you with your veneers, crowns and fillings. With a complete suite of services available at the one clinic, we provide the best possible treatment by appropriately qualified clinicians using the most sophisticated technological tools. At Smile Solutions our prosthodontists work in conjunction with our team of general dentists, specialists, technicians and other dental professionals to develop solutions for your dental needs. With our own in-house lab, all your veneers and crowns can be manufactured on site, saving you time and allowing your clinicians to provide seamless, coordinated treatment. We can even alter your prosthetic device immediately if necessary.